The Star of South Africa, a 47.69-carat old style pear-shaped diamond, was cut from a crystal of 83.50 carats, and is credited with being the diamond that turned the tides of fortune in South Africa. In 1869, it was picked up by a Griqua shepherd boy on the Zandfontein Farm near the Orange River. Schalk van Niekerk, who three years earlier had had a stroke of luck with a "pebble" that proved to be a 21.25-carat diamond (the Eureka Diamond), traded the young native for the stone, giving him five hundred sheep, ten oxen, and a horse. It was practically all of Niekerk's possessions, but a few days later in Hopetown he sold the rough crystal for $56,000. is a 'stellar brilliant' cut. This drawing is an educated guess at its facet arrangement. 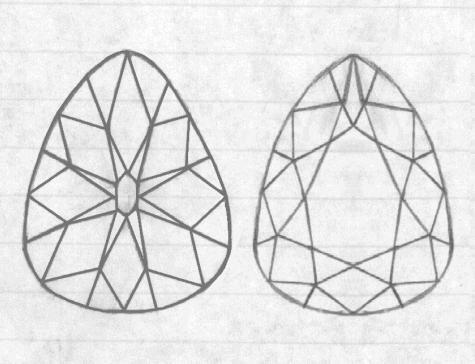 Later, the stone was purchased by Louis Hond, a diamond cutter, and fashioned to what was described as an "oval, three-sided brilliant" and was sold to the Earl of Dudley for $125,000 (or about £25,000). 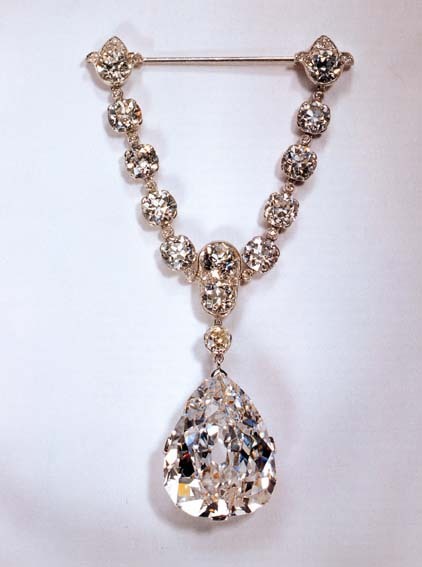 The Countess Dudley wore it as a hair ornament, surrounded by 95 smaller diamonds. The diamond resided Natural History Museum in London for a period of time in the early 2000s and was also part of the "Cartier In America" traveling exhibit in 2009 - 2010.